Who would choose distance learning? Who would choose to study in the evenings for twenty hours a week, alongside a full-time job? That person would be me. I am addicted to two things in life, heritage and knowledge. If the heritage sector is the bread and butter I eat; my thirst for knowledge is the fine wine I serve with it. This may seem quite an odd combination of food and drink, readers, but a perfect non-aesthetic combination for one who immerses themself as much as possible in their hobby and livelihood- heritage. I am a librarian first and foremost. I trained at Manchester Metropolitan University for a Postgraduate Diploma in Library and Information Management and graduated as a rookie in 2008. I have worked my whole career in libraries and heritage, beginning with a professional post in Rochdale in the same year as my graduation. I worked hard on my career for years- putting University behind me and gaining a plethora of professional experience, including working as Local Studies Librarian at Westminster Archives and as Curator for Library and Archives at Ironbridge Gorge Museums. Before landing my dream job as Librarian for Manx National Heritage in June 2018. It was during my time at Ironbridge Gorge that I decided that I wanted to learn more and formalise my career in heritage. So I embarked on a distance learning Masters in Heritage and Interpretation with the University of Leicester in 2016, whilst I was still across. That meant not attending University- but studying online in my spare time. I had not used my brain academically in 8 years and I had just committed myself to a few years of part-time academic study and an extra 20 hours a week at that! I was petrified! I was 27 when I first learned that I had Dyspraxia, a developmental condition, causing difficulty in activities requiring coordination and movement. It is very similar to Dyslexia, but what I describe as “Dyslexia of the co-ordination”- laced with similar reading and comprehension issues suffered by Dyslexics. Suzi during a day of study in our Reading Room, outside of her normal working hours. Would I fair well? Of course I would and did! All the learning material was available digitally, so this meant that I could programme my computer to enlarge font size and change paper colour to make the course more print-based-learning-disability friendly. I also acquired screen reading software to assist with my understanding, as I am a definite auditory learner if faced with reading numerous academic journals per night! For distance learners, organisation is the key. Have dinner ready in the slow cooker when you get home, eat and then it’s straight on to studying. I pace myself and have two free evenings a week and one day at the weekend. Do I enjoy studying? Do I mourn my loss of free time? No, my passion for heritage and my career is a big part of who I am. I absorb history and heritage. 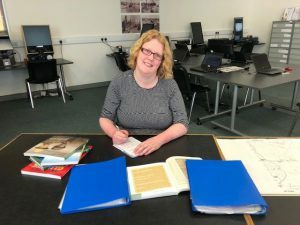 It is a pleasure coming to work and knowing I am going to be working with an amazing team, to be able to help others to access the past and to absorb all I can about Manx heritage and culture. 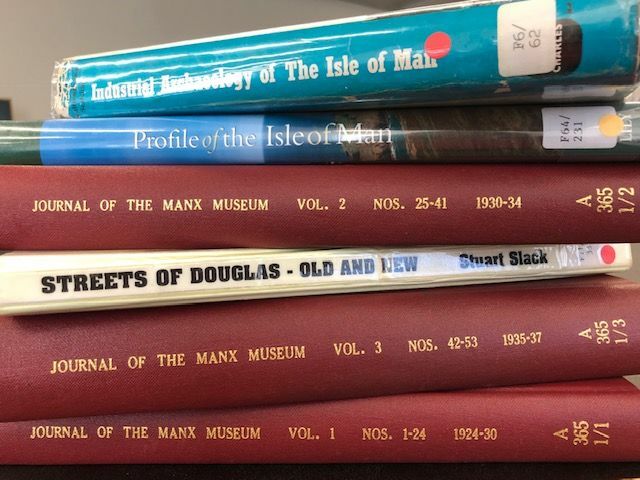 I also get to work with and manage some incredible collections- notably the extensive Manx National Heritage Newspaper collection, which commences in 1792. There have been hiccups along the way, as there inevitably will be with “life”. The moving operation to the Island, from Shropshire, in June 2018 was a huge undertaking for me and I delayed my studies for six months to accommodate for the change. Books and journals, part of our printed collection at Manx National Heritage Library and Archives. Useful for any researcher or student. I have moved to a wonderful Island and I have enjoyed settling into new surroundings and my studies have now resumed. I have planned my academics around Manx Heritage, as my dissertation will explore the intangible heritage of the Island. Intangible heritage being heritage with non-physical matter- such as poetry, dance, song, way-of-life and culture. I intend to study how this has been captured and preserved for future generations. I will finish my studies in March 2020. I will be 36 when I graduate my Masters, but I don’t intend to stop there. I have a friend, who at 74-years-young, has just graduated with an M.A. in creative writing. I want to be like her- not necessarily studying at University- but carrying on the pursuit of knowledge through reading, writing and discovering for myself.